A large part going keto is focusing on getting adequate fat into your diet. No, not the kind of fat found in cakes and cookies. We’re talking about healthy fats here. Healthy fats include monosaturated and polyunsaturated fat. Stay away from the saturated fats as they are known to increase cholesterol levels and your risk of heart disease. Yikes. If you’re getting tired of plain ol’ almond milk, then good news because you can have more than water and almond milk on keto. Even if you’re more likely to burn down the kitchen than whip up a scrumptious meal, you won’t be able to go wrong with this one: It’s that easy! Combine all ingredients in a blender and whizz away. Alternatively, add butter into a cup of freshly brewed coffee and stir to combine. We recommend the blender method, however. It can be frustrating trying to get these two to come together because, well, oil and water don’t mix. Still, go for the manual method if it’s more convenient. Want something cool and refreshing? Have it with ice! 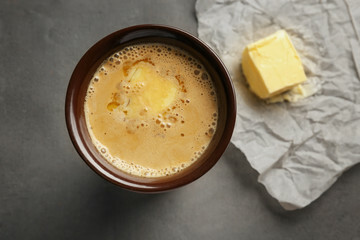 Whip up a batch of bulletproof coffee, but replace the butter with ghee. That way, the fat won’t be separated out when iced. Why add butter into coffee? The Ethiopians and Tibetans deserve credit for this one. Their people have been adding butter into their coffee way before the Keto diet was born. Dave Asprey first came across this concept when hiking in Tibet. He brought back the basic recipe and made improvements to it. Today, it is commonly known by its name “Bulletproof coffee”. The fat from butter gives you a sense of fullness curbs further cravings. The amount of fat can be adapted to suit your macro goals on the diet. If you make keto coffee use high-quality, grass-fed butter and low-toxin coffee to further supercharge your day. This way, you’ll need not fear inflammation. Because it’s just two ingredients, it’s worth your while to spend a bit more on getting better quality ingredients for the best results. While on keto, some may experience periods of fatigue before entering ketosis. What better way to keep your energy levels high with a caffeine boost to start your day? No harm sneak some extra fats into your diet along the way too! A cup of bulletproof in the morning will do more than just wake you up: it will ramp up your metabolism, and break your fast after sleeping, prepping your body to absorb the nutrients that you consume later on.